Owing to abundant snowfall, relatively moderate wintertime temperatures, and expansive mountain ranges, Colorado ranks among the top recreational ski destinations in the world. Colorado’s rich ski history includes figures such as Father Dyers, crossing Mosquito Pass on his skis to visit mining camps, and locations like Camp Hale, the training camp for the 10th Mountain Division during World War II. Today Colorado is home to almost 50 ski areas that log over 12,000,000 annual ski visits. With all of that activity on our slopes, accidents are inevitable. While skiing is not a contact sport, it involves coordination, high velocity, and muscle endurance to prevent injury and strain. Hips & Back: Lie on your back, bend your knees and let them fall to one side. Keep your arms out to the side and let your back and hips rotate with your knees. Quads & Hamstrings: Kneel onto one knee and place your opposite foot on the floor in front of you. In this lunge position, push your hips forward. Hold onto something for balance, if necessary. Standing Toe-up Achilles Stretch: Stand up and place the ball of your foot onto a step, raised object, or against a wall. Bend your knee and lean forward. Perfect your technique: Take a ski class from a professional before hitting the slopes. Prepare your gear: Make sure you have the right ski boots, bindings, and ski length for your body type and level of skill. Wear appropriate safety gear, such as helmets and wrist guards. Prepare your body: A good conditioning routine, including strength training, cardio, flexibility, and balance exercises, can help increase your strength and endurance on the slopes. Stay on the Trail: Especially while you’re learning, stay on terrain you’re comfortable with. Steeper terrain means higher speeds and greater potential for injury, and leaving park bounds means new conditions and more danger. If you are tired, rest: Mistakes (and injuries) are far more common when we’re fatigued. Design improvements in skis and bindings have resulted in a dramatic reduction in the risk of injury from skiing, specifically fractured bones. At the same time, larger crowds and higher speeds have created a higher risk for spine and joint damage resulting from collisions and falls. A third of all injuries in skiing are suffered by the knee joint, most commonly menisci, cruciate, and collateral injuries. Meniscal injuries occur during a fall when the ski bindings fail to release. When this occurs, the skier twists the lower leg and risks a meniscus tear or strain. Common signs of this condition are pain, swelling, inability to bend the knee, clicking and “giving way” of the knee. 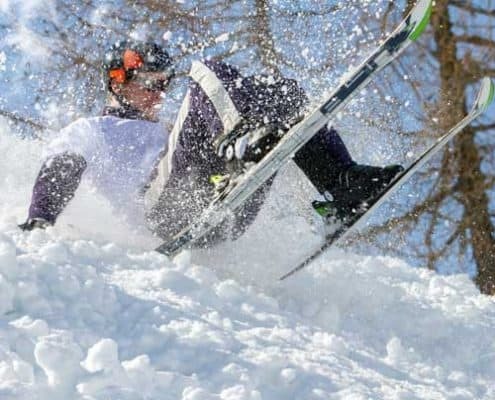 A torn anterior cruciate ligament (torn ACL) can occur when a skier falls and twists the downhill leg, or during an off-balance landing after a jump. The most common indication of a torn ACL is an audible “pop” followed by extreme pain, swelling, and stiffness. Less common, but more severe, is “O’Donoghue’s triad,” or simultaneous complete (or partial) tear of the anterior cruciate ligament (ACL), medial collateral ligament (MCL), and the medial meniscus. Knee injuries are initially treated with the RICE (Rest, Ice, Compression, Elevation) principle, which will help minimize the pain and reduce the swelling. With most knee injuries, the goal is to stabilize the injury with knee supports (or braces) and begin a program of exercise, therapy, and rehabilitation to facilitate natural healing and conditioning. If the pain of the injury is too severe to resume even normal activities with the help of a brace, your doctor may recommend a pain management program. In these cases, treatments such as injection and prescription medications can help ease the pain of the injury and allow your body to resume its healing process. Spinal injuries from ski accidents are far less common than knee injuries – that’s the good news. The bad news is that they are usually far more serious and require much more time off the slopes for recovery. The most common spinal ski injuries come from stress or torsion on the spine during a hard fall or a collision. When minor injuries happen, they usually include pain and numbness. After the adrenaline has faded, these injuries will result in restricted movement and aches and pains. People who have suffered from this type of injury may be prone to more frequent back pain in the future, so it’s important to be examined by a physician no matter how minor your injury seems. Major spine injuries from ski accidents are another story. Symptoms of these injuries can include loss of movement, difficulty breathing, loss of control of bodily functions, and muscle spasms. These symptoms, obviously, should not be ignored! Major spinal injuries can lead to partial or total paralysis, so get to an emergency room as quickly as possible. Just like with knee injuries, the goal behind treating a spine injury is to manage pain and resume normal activities as much as possible. Nursing the injury with inactivity and immobility only delays the healing process. Physical therapy, exercise, and movement are necessary for recovery from spine injuries, as well as strengthening your body to prevent further pain and re-injury. Regardless of how minor your accident may have seemed, pain from the injury can take days or even weeks to be fully felt. If you have even a passing concern that you may have injured your back, knees, shoulders, or tailbone while skiing or snowboarding, the safe bet is to consult a physician who can help keep you on the slopes where you belong.